In the late 1950s and the subsequent two decades, while a student, getting married, starting a family, involved in social activism and short careers in the church and in urban housing, Lowell Hayes made art in almost any style from abstract to realistic to pop, op and conceptual. Even before that he sometimes stuck objects into paintings and built up surfaces deeper than impasto. From every historical or contemporary style more possibilities were gained and everything from beauty to ideas became eligible to be aesthetic, to be art. Moving back to the high country in the early seventies Hayes began to work through his aversion to the landscape genre (which seemed to him just too hackneyed to be taken seriously nowadays) and his need to justify artmaking by making art for and about causes and morality. The beauty, forms, implicit energy and atmospherics of the mountains demanded the development of a whole new approach to landscaping painting; something more immediate, less objective, more touching but less sentimental, less easily taken for granted. The loose, gestural Whitewater (aka, humorously, the wallboard period) and Big Green suites, used building scraps, house paints, fabrics and block filler assembled in rapid, dance-like executions. Non-pictive, sociopolitical and enviro-political works continued to appear, as well. The 1973 fuel shortage produced The Fat Lady National Memorial. From the eighties there are the Guatemala Suite, Defense of Values, Asphalt Mountain with Bleeding Bunny, Wow Man! (Ruin on the Watauga) and the interactive An Evolution Game. A Charleston College involved the entire city of Charleston, West Virginia and its media. There was XY2 a suite of near photo-real portraits of men who were experiencing womens liberation. A group of small landscapes and nudes from this period were recently exhibited at the Turchin Center for the Arts in Boone. In 1981 The National Museum of American Art in D.C mounted the historic exhibition More Than Land and Sky, Art From Appalachia. 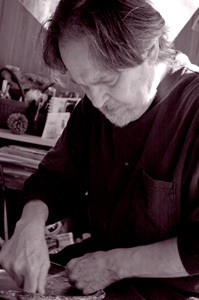 Hayes work A TVA Commonplace was made famous by its use as a media image for that show, nationwide and regionally, and the artist appeared with the work on the Charles Kuralts Sunday Morning on CBS, was interviewed on NPR, by the New York Times and Art in America. The exhibition traveled for three years throughout Appalachia, including twelve major museums from New York to Alabama. The Tennessee State Museum purchased A TVA Commonplace and later featured it in a statewide tour. Two more decades have put works on several magazine covers and into dozens of collections including those of J and P Petschuer, Appalachian State, UNC Chapel Hill Medical Complex Board room, The Tennessee State Museum. 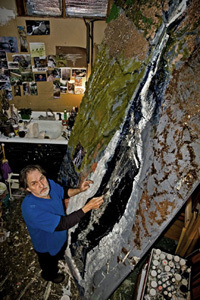 Hayes works full time to supply the demand for his landscapes, which have evolved into a truly unique bas relief style combining realistic painting and building up images with sticks, stones and anything that works. Hayes says hes trying to go right through sentimentality (about nature) to actual emotional connections for at least contacts. Simultaneously, Hayes still paints figures which are not usually bas relief, just to keep my painting sharp. For that theres nothing like skin, body language and portraiture. Lowell Hayes was born near old Butler, Tennessee (before Watauga Lake) in 1936. He has a B.A. from Lynchburg College and a B.D. from the University of Chicago. He has lived Valle Crucis, North Carolina since 1972. The new work of Lowell Hayes has an astounding presence. The images themselves are palpable representatives of our native mountain woods unmarred by man, with the stately and iconic hemlock commanding the eye as subject. Actually, even to use the term image is patently inadequate, for these paintings/constructions go far beyond what most of us have ever seen that has been entitled artwork. These scenes are of natural material that transcends itself, if that can be understood, to become open holy ground into which the mind can wander in amazement and the body can activate through the visceral sensation of being in a particular place at a particular time, far outside the present moment of the viewing. To succeed at such a feat of beautiful transcendence is not an easy undertaking, nor is it common these days for an artist to even attempt such a scale and altitude. Most current landscape painting these days is bucolic and blatantly reportage. Little attempt is made to address the spiritual matters of environment that we so desperately need to be taught by. The mountain woods is not just a place to walk through or a place severely in need of development. It is a community of unique beings who when quietly asked, are willing to give up their secrets to the patient and listening consciousness and the passive eye that lets the mystery in, in its fullness. Hayes has done something here that will endure into the coming decades, becoming more and more precious as the content is recognized and understood for what it is. Profound. Just the mechanics required to build these objects seems part Rube Goldberg and part Divine. How did he do that, we mutter to ourselves. The painted limb in a shadow transfixes us and destroys any doubt about the reality of the depiction. Yes, it is real bark and yes, there are real leaves, but folks, remember, you are looking at something that is presenting itself as an illusion. Could this experience be any more ironic? Those of us who have been around here for a while can understand how this all came about a little easier that most. We have seen the years of work on the vocabulary and structure and we have viewed the variating palette and the subjects of interest edging in and out of political statement and sheer beauty for beautys sake. So, it should not be surprising that we have arrived here. But, it is surprising. It is surprising for us because what we are now seeing so transforms the viewing experience, that it nearly erases all that has come before with the intense fire of work totally committed to this new and particular experience. The generosity of offering this much life energy to us as audience, is hard to comprehend. When a close examination of surface is done, it becomes obvious that hundreds of hours of effort have gone into what we see. It also becomes obvious that the skill required to draw, paint and build such representations could only have come about through intense personal study and observation. Photorealism had its day a decade or so ago and it could be said that somehow this could be seen as photorealism in 3D, but there is much more to it than that. It is not just the image that the artist has provided, but the soul of the experience that a human being has when inside of an actual ancient wooded space, away from the car, away from the house, away from the loved ones and away from our own limited and named self. This is the instant of sight that opens a clarity of the mind that informs everything in us at once. As I walked away from these wonderful things, I could only feel gratitude.